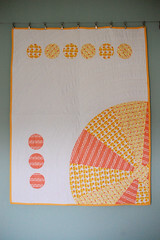 i wanted to make a baby quilt that wasn’t babyish - cute but not twee. i don’t think i did too bad a job. i learned more about fabric design working with my spoonflower fabrics (i.e. it’s much easier - and more economical - to work with non-directional prints than directional ones). i learned how to starch properly, following the method here instead of the one on the side of the pack, and found how much easier it makes piecing and applique and making binding (i.e. i didn’t use it on the binding and it was a pig to sew). i learned that attempting to machine applique a few mm from the edge of the piece doesn’t really cut the mustard (although you can’t really tell from any distance). i learned the tightest curve i can manage with a quilting-length stitch and a walking foot (the answer being “not as tight as these damned circles!”). i learned (after much swearing) that a blunt needle causes skipped stitches, as does one which is too light for the fabric/layers you’re trying to sew through. i learned that lots of stopping and starting in quilting is Bad, and that a locking stitch would be a mighty fine thing to have on a quilting machine. 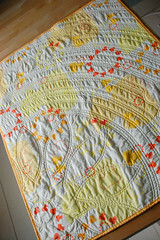 having said that, i’m happy enough with the quilting design to overlook the little runs of locking stitches. i learned that when your poncey adjustable glass-shaded lamp has a note in the box warning you have to hold it when you adjust it in case it falls and the shade breaks you should take this as a sign that it’s crappily designed and will loosen and smash all over your quilt if you so much as look at it and return it immediately to the shop. i subconsciously took rather more inspiration than i realised from this little quilt the lovely josie at mr monkeysuit (she of owl quilt fame) made for hillary lang at wee wonderfuls. i checked back on it as i knew it had been somewhere in the back of my mind with the circles and was rather alarmed at quite how similar my duckies ended up :eek: . 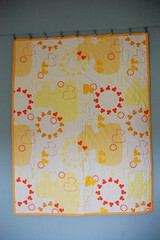 on the other hand, the inspiration i took for the quilting from this exquisite quilt of alex’s was entirely conscious. i don’t believe i’ve seen the full quilt - i’ve wandered through moonstitches a few times looking in case i missed it but i don’t think i did. 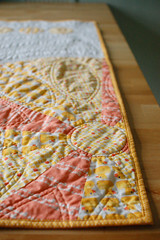 i really really want to see it, alex is my quilting heroine. the top was a little awkward at times, but mostly trouble-free. 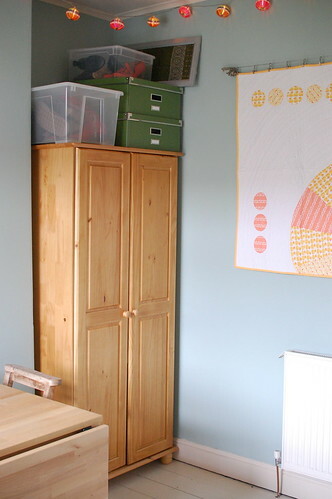 i set out to use as much of my 3 spoonflower FQs as possible on the top, i worked the design out by cutting up to-scale pieces of coloured paper. 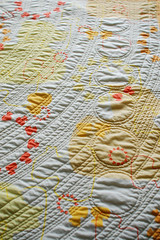 the big circle used the bulk of the fabrics and i just played with placing the small circles until it looked right. i would pay slightly more attention to the orientation and arrangement of the little circles if i did it over again. all the circles are appliqued: starched, pressed around a template and bodgingly stitched a few mm from the edge w/straight stitch - i wouldn’t do this again, i’d rather hand stitch, for that little extra time the finish is miles better. after i’d pieced the large circle i wasn’t happy with the bulk at the centre and i’d read recently someone say they’d had the same and chopped out the middle, so i appliqued another circle over the top then trimmed the underneath away. similarly, i “appliqued” the large circle onto the white ground and then cut out underneath - i did have a trial run at piecing curves and decided that with my sewing skillz this was by far the better way! the overall size was determined by the backing, which is my one yard print. the finished quilt is 40”x31” and would have been larger had i not lopped off part of the top i thought i wouldn’t need somewhat prematurely. i knew what i wanted to do with the basics of the quilting - i have a thing about pintucks, and what i think of as japanese parallel lines of quilting - and i knew i wanted it to be curved and irregular, to keep it from being too stiff. and i wanted to bed the smaller circles firmly in that pool of ripples, without disturbing it too much. but i kind of stalled at that point. i hadn’t realised quite how much the large circle would scream “beach ball” once i’d added the smaller circle in the centre, but i certainly didn’t want to emphasise that by stitching in (or roughly-in-the-vicinity-of :lol: ) the ditches. but when i saw this picture i thought this simple pattern would fit in the segments, echoing the double lines around the small circles. i liked that it would be rather looser to offest the potential for death by quilting elsewhere :D the finished daisy effect isn’t quite in keeping with the mood i was aiming for, but i don’t think it’s a terrible choice. 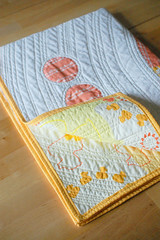 i picked a binding from my stash, it had to be polka dots really, and happily i had plenty of suitable yellows stashed. the simple joy of bias tape making aside i wouldn’t bother with a single-pass binding again. even using the walking foot i had problems with puckering and - despite my aversion to unpicking - i had to redo it several times until i got anything even vaguely satisfactory. i much prefer the finish on a turned binding, i think i might even revisit the improvised technique i used on the balloon quilt, since it made a nice neat finish without any obviously wandering stitching. i’ve tried it for size and it’s a perfect fit for the cot, but for the moment it’s staying on the wire so i can take it in properly.